The end of a relationship can be one of the most challenging times in life. Following separation, there are many practical and legal issues to sort out when it comes to children, finances, property and more. It’s easy to overlook the little things that need to be addressed, particularly if you are feeling stressed or overwhelmed. 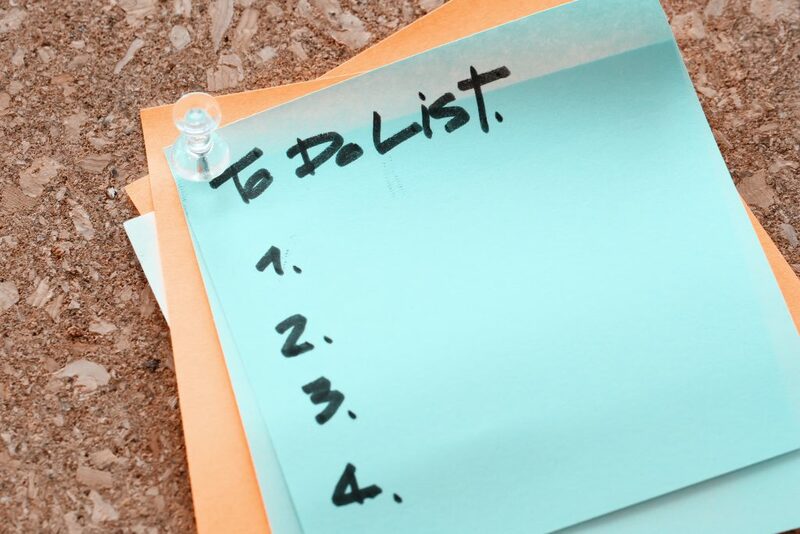 A separation to-do list can help you cover off the things you need to sort out – without having to remember everything off the top of your head. Making sure you have the right records and documents will help your lawyer negotiate your property settlement. Write down the date of your separation – this is when you decided your relationship was over and you communicated it to your partner. You might still be living together under one roof after your separation date, however this will be the date used for your property settlement. Make a list of all your assets and liabilities and their estimated values. Try to get access to all your financial records, and your former partner’s, and make copies of them for your lawyer. This will help to establish the history of contributions and transactions throughout your partnership. Keep your records safe by changing your passwords on all your computers and online accounts to protect your privacy. This includes any email accounts, social media accounts, online banking, PayPal, eBay, and any other websites you use. If you hold any joint accounts with your former partner, you might ask your bank to require both parties approve any transactions, or request notification regarding any large transactions. If you are the primary cardholder on any credit card accounts, consider cancelling the secondary card, once you have informed your former partner. The above actions may have legal consequences and you should speak with your lawyer first regarding your individual circumstances before taking any action. Review your insurance policies and your superannuation accounts to check whether your former partner has authority to transact. You should also review who your beneficiaries are. If you and your former partner use the same accountant, make sure they won’t have access to your personal or financial information after your separation. In the event something should happen to you prior to a property settlement being finalised, your former partner may inherit assets under your will. It’s advisable to get a new will following separation – even if only temporary – to ensure your children or closest family members benefit from your Estate. Decide whether one of you will move out, or whether you will sell the house and both move out. If you want to sell, the house will need to be made presentable for inspections. If one of you stays in the family home, it’s often convenient for the primary caregiver of your children to stay so that the children suffer minimal disruption. If you’ve moved out, set up a mail redirect so that you’ll receive your correspondence on time, and in a confidential way. Check your utility accounts to see whose name is on the account and who has authority to act. If an account is in your former partner’s name, they might shut off services without your consent. If the account is in your name, you should keep paying all utility bills so that you don’t damage your credit rating. Tell your child’s school and teachers that you and your former partner have separated, and make sure they have the contact details for both parents. You should not tell the school about your reasons for separation, but you should inform them if you and your former partner have agreed particular days for school pickups, etc. The most important thing to do is get reliable legal advice. Paterson & Dowding are respected family lawyers in Perth, with extensive experience in divorce, parenting matters, and property settlement. If you’re separating from your partner and you need advice on your parenting or financial arrangements, call Paterson & Dowding on 08 9226 3300, or visit www.patersondowding.com.au to find out more.